Canon 800mm f/5.6L IS lens with the EOS-1D MIV. ISO 50 with a 3-stop drop-in ND filter in place. Evaluative metering +2/3 stop: 1/15 sec. at f/8. 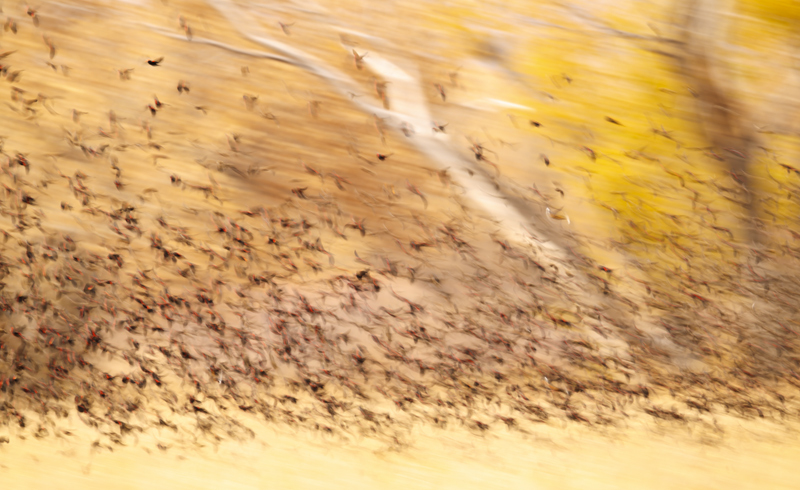 When creating pleasing blurs of flocks of birds in flight, it always pays to be aware of the background. When I saw the birds pass in front of the tree with the gnarly trunk, my face lit up with a smile as I held the shutter button down. For good reason. Using a light-robbing filter as I did here will always get you a wider, more dust-bunny-friendly aperture; working at f/32 will ensure that you see every microscopic bit of sensor dust…. And on sunny days it will allow you to work with slower shutter speeds at a given ISO.
. Slide program on the evening of Friday, NOV 18. 7-FULL DAYS: $3299. (Non-refundable deposit: $500; see details below.) Limit: 10/Openings: 8. Co-leaders: Robert O’Toole & Jim Heupel. Geese, cranes, ducks, sunrises, sunsets, and blast-offs. Live, eat, and breathe photography with one of (if not the) world’s premier photographic educators at one of his very favorite locations on the planet. Plus great co-leaders and top-notch Photoshop instruction. Please see terms and deposit info in item last below. With my ever-shrinking teaching schedule and all but this spring’s SW Florida IPT sold out, this trip may well represent a rare opportunity so do not wait too long before sending your deposit. Clemens van der Werf who was on this year’s Bosque trip is already registered for next year. Canon 800mm f/5.6L IS lens with the EOS-1D MIV. ISO 400 (in the pre-dawn). Evaluative metering +1 stop: 1/30 sec. at f/6.3. 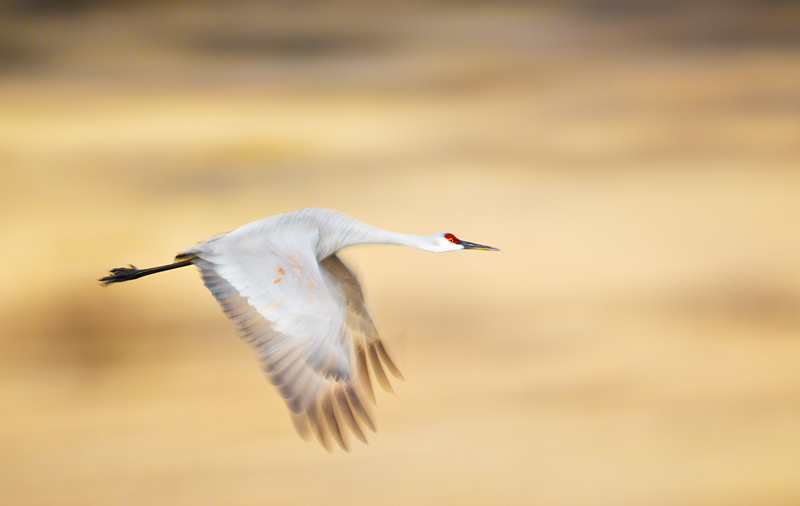 As detailed in “A Guide to Pleasing Blurs” you can get the subject’s eye sharp (and the wings blurred) when working at the intermediate blur speeds (1/30 to 1/250 sec) by perfectly matching the speed of the bird in flight with your panning rate. The soft Southwestern color scheme that prevails at Bosque is one of the reasons that I love the place so much. That and the steak fajitas at K-Bob’s :). The Barnegat Site Guide (6190 words, 68 images) is available from BIRDS AS ART by e-mail as a PDF for only $22. You can call Jim with a credit card in hand at 863-692-0906, send us a Paypal to birdsasart@att.net, or purchase it through the store here. Canon EF 800mm f/5.6L IS II with the 1.4XII TC and the EOS-1D MIV. ISO 500. Evaluative metering +1/3 stop: 1/250 sec. at f/8. 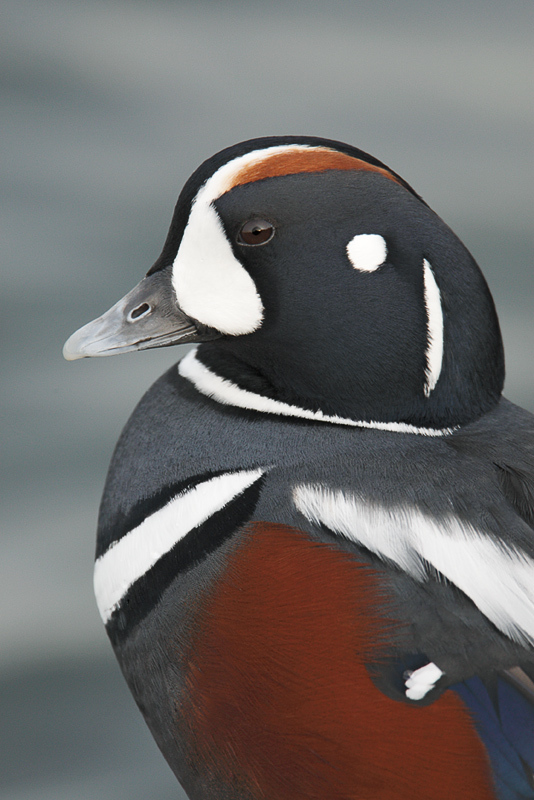 Harlequins are about as handsome as ducks get. Here I crouched down to hide my form behind a large jetty boulder to get close, and then stood up slowly with my lens just making it over the big rock. It worked! In the Site Guide Denise shares a great tip for getting close to the swimming sea ducks. PH: I got your Mark IV User’s Guide and found the information quite useful. PH: What’s not in the guide are many comments on exposure settings. I know you frequently cite the the exposure info on your Mk4 images in the BLOG and at BPN, and then cross-reference Digital Basics and ABP I and II (all of which I have). You’ve also said you can no longer make general statements/recommendations on exposure settings because of differences between various cameras and/or sensors. PH: But for those of us using MK iv’s, is it fair to ask, do the basic suggestions/settings for lighting and color of subject as described in Digital Basics and ABP I and II apply directly to the Mark IV. AM: Is it fair? Sure, all’s fair in love and war and exposure. PH: If not, is there some general correction factor? I think others might also find it helpful to have your expertise on this subject in the Mark IV User’s Guide and still not give away all the info that’s in your other publications/guides. AM: Several things here. First off, the fact is that the MIV UG does not deal much with exposure; I had assumed that folks read the Bulletins and the Blog and pay attention to our legendary educational captions :). Second, I have shared everything that I know about exposure for free in the Bulletins and the Blog, all for free so as far as exposure goes, there is no need to protect that info for profit. And finally, Peter, have you not heard me say/read on the blog/read in Bulletins/mention everywhere that I have posted a MIII or MIV image at least 500 times that “The Mark III and the MARK IV need more light added to the suggested exposure than any other camera”? I have been giving that info away for free for about five years now. Furthermore, how do you get the right exposure with any camera? Get some data in the fifth histogram box. What could be easier???? AM: Actually somewhere is everywhere. Sorry if I went on a mild rant. From the third e-mail. (Peter had sent a second e-mail with some exposure questions but quickly followed it up with a third. That exchange follows. PH: I thought about it some more, and think I have answered my own questions. From histograms you’ve shown with some of your photos, usually your highlight data is usually placed into inner/left-most third or at most half way into fifth column. AM: Actually I strive to place it very close to the edge but what you described above is perfect for most folks. And, since the histogram is based on the JPEG (that is more contrasty) I do not mind a very few flashing pixels especially in images with significant shadow areas that I do not want under-exposed. PH: So that probably only leaves +1/3 to +1/2 stop more of exposure before you’d blowout the highlights/whites. AM: Since I am almost always pushing the exposure to the right I rarely have that much room. 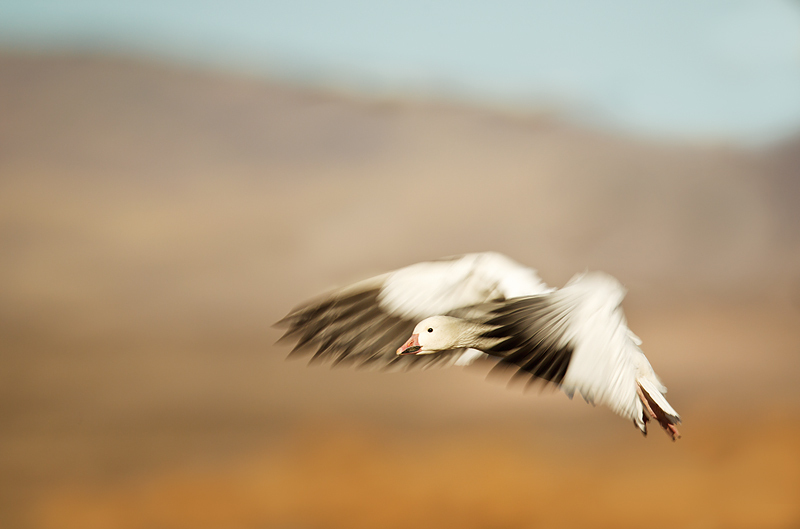 PH: It just seems amazing that you can concentrate on changing background colors, assess tonality of the snow geese on incoming /banking BIF shots and still make necessary 1/3 stop exposure compensations in a split second. AM: You are missing the boat above. 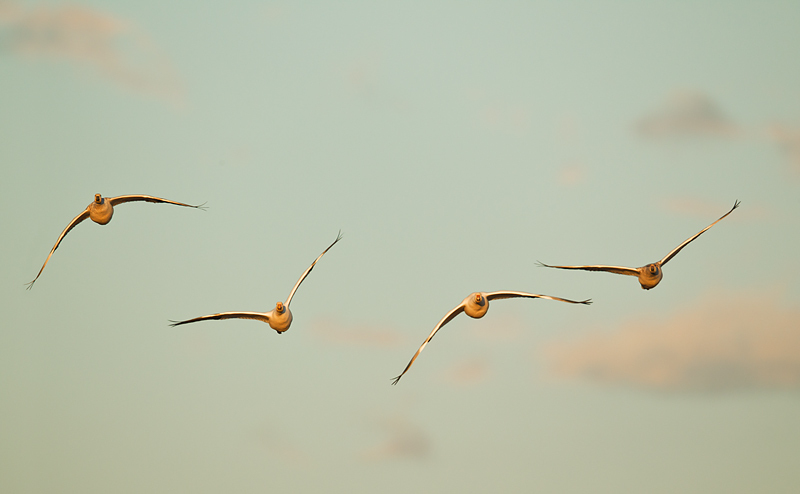 The background colors and tonality have zero to do with it when you are working in Manual mode as described here. Adult Blue Goose: 1/3 stop lighter (than for the adult white geese). Why? Though the adult blue morphs have white heads the white is not as bright nor as extensive as the whites on the sides of the adult white geese and I want to give some additional light to the dark blue feathers. Sandhill Crane: 1/3 stop lighter (than for the adult white geese). Why? Though these birds have white necks that white is not as bright or anywhere near as extensive as the whites on the sides of the adult white geese and I want to give some additional light for the gray feathers. Very light middle tones do not need as much light as whites to be properly exposed. Immature blue morph Snow Goose: +1 or +1 1/3 stops (than for the adult white geese). Why? These birds, though they look quite dark when surrounded by all those white geese, are essentially middle toned or a bit darker, thus they require about a stop more light than the adult white geese. Raven: +2 full stops (than for the adult white geese). Why? Ravens are black. Blacks require about 2 full stops more light to be properly exposed than the adult white geese. Fact, like it or not: various tonalities require varying amounts of light to be properly exposed. Folks who believe that once they know the correct exposure for a middle tone that that is the correct exposure for all tonalities are quite mis-guided. The number of experienced photographers who do not understand the basic concepts that I have outlined above is truly mind boggling. I doubt if one in a hundred folks have exposure theory down pat. That is why I urge everyone to get a copy of the original The Art of Bird Photography and study the section on Exposure Theory–pages 58-64 (and especially the chart on page 62) until they have the concepts down cold…. Next I recommend that folks master the concepts covered in “Exposure Simplified” in The Art of Bird Photography II (916 pages on CD only). If you own both books it’s time to get to work. If not, you can save $10 by ordering the two-book bundle here. I responded: “Yes. I will do that. It is a subject that has been well-covered ABP II and mentioned and written many, many times elsewhere, and I quote (somewhat off hand): “In situations where the light is constant and the background changes from one instant to the next, it is imperative that you be in Manual mode. Here is another e-mail exchange, this one with BPN member Alan Rube. AR: Artie, I really liked the your NIK HDR Efex pro image. I have seen many shots similar (including ones I’ve taken) but this image is tops. HDR with Nik Efex Pro adds a lot, but the user skill level was tremendous for creating a image that realistically captured the wide dynamic range of the subject. Do you have favorite pre-sets or do you just try different ones, convert to tiff, and evaluate? Do you do raw conversions first in ACR and then “blend” the tiffs or do you use efex pro on the raw files? Any other thoughts? AM: Actually, making the images for an HDR is one of the simpler things that I do…. 1-Recognize that you need HDR. In the bulletin image the big problem was the white sky on the right above the horizon. If you expose dark enough so as to capture detail there, the rest of the image will be grossly under-exposed. 2-With your rig on a tripod, compose a pleasing image, check your bubble level, and make sure that everything is locked down tight included all of the tripod knobs and, in addition, the tripod collar if you are using any sort of telephoto lens. 3-It is important to work in Av mode and set the aperture that you want. That way the camera will change the shutter speeds for your AB sequence and you will not have any depth-of-field mis-match issues. 4-Next I set my base exposure compensation. With all the dark areas in this image and that very white bit of sky, I went with –1 and as I recall this still had the sky well over-exposed, but not to worry. 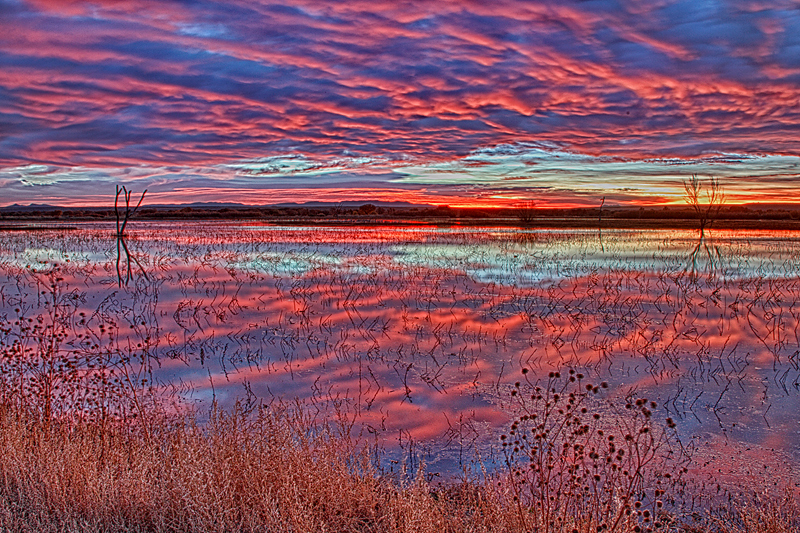 With my HDR capture technique, I knew that I would be creating an image two stops darker as part of the sequence. See item next. 4- Then I hold down the two buttons to bring up the Auto Exposure Bracketing (AEB) analog scale and set the AEB compensation to 1 full stop. (Note: I have already set five-frame AEB which is a custom function item on my Mark IV bodies . 5-Then I will either hold the shutter button or set up the self timer. In this case I held down the shutter buttons as even the darkest exposure was several seconds; mirror slap is not a problem with exposures that are measured in seconds. 6-After I make my first series of images I check to make sure that the highlights are well away from the right edge of the histogram in the darkest image and the dark areas e well away from the left edge of the histogram in the lightest image. That is almost always the case. If not, I might try a different base exposure compensation. Or I might try increasing the AEB amount. Or in extreme cases, I might go into the custom functions and set seven-frame AEB. 7-Once I have the images in BreezeBrowser, I will select three or four or five of the images for my HDR discarding those that are either way, way too light or way, way too dark. I just eyeball it to make that decision rather than checking the histograms. 8-Then I convert those images straight up using BreezeBrowser (even though I use ACR for nearly all of my RAW conversions). By straight up I mean with no exposure compensation or other adjustments. 9-Next I open CS-5, hit File/Automate/Merge to HDR Efex Pro. (This workflow step eliminates any bit-depth issues.) Then I browse to the folder that contains the images, select the ones that I want for my HDR, hit Open, and then hit OK.
10-Even with my very fast laptop, it takes a few minutes to crank out the HDR file. Once it opens, I play around with the various pre-sets–there are 33 in all. The small thumbnails give you a good idea of what the image will look like. Once you click on a pre-set a preview generates in several seconds. Once you like one best, you can tweak a variety of sliders. I always activate the histogram view so that I am positive that I have not tweaked in any over-exposure. When you are done, hit OK and the image will open in Photoshop where additional tweaking may be done. I am an HDR dummy but NIK’s HDR Efex Pro has improved the quality of my output files by leaps and bounds. Canon 24-105mm IS L lens (at 24mm) with the EOS-1D MIV. ISO 400. Five frame bracketed around Evaluative metering -1 stop at f/14. Camera and lens on the Giotto’s MH 1302-655 (Tiny) Ballhead. Learn why and how I use this head here. This is a funkier/grungier version of the image that Alan was referring to in Bulletin 350. It was created with the Strong Counterlight pre-set in NIK HDR Efex Pro. You can save 15% on all NIK products by clicking here and entering BAA in the Promo Code box at check-out. Then hit Apply to see your savings. I have been using and learning and loving COLOR EFEX and SILVER EFEX also. The just updated and annotated Complete Bosque Site Guide (191 pages, 20673 words, 160 photographs) and the Bosque 2010 Site Guide Update Only will be sent (in separate e-mails) to all who have previously purchased the guide (updates are free for life) no later than close-of-business on Tuesday December 13. Feel free to e-mail us if you have a new e-mail address. Canon 800mm f/5.6L IS lens with the EOS-1D MIV. ISO 200. Evaluative metering +2 stops: 1/8 sec. at f/11. 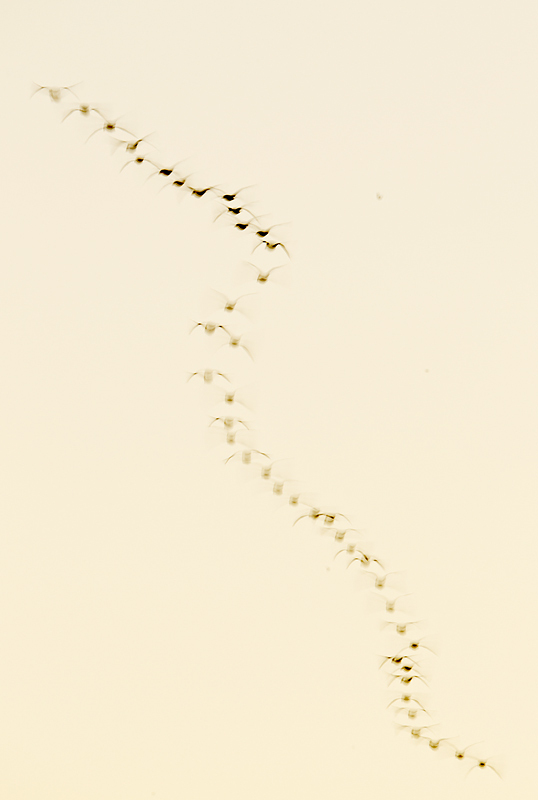 This image of geese returning to the impoundments was created from my favorite sunset spot on the tour loop. Being in the right spot lets you photograph silhouetted birds to the west and birds in the pink/purple/blue to the east. Note: 45-Point AI Servo AF. Canon EOS-40D body in very good shape, two canon BP11 batteries and the charger, shipped in the original box with all of the original software discs, cables and manuals (still in original wrappings) and the Canon EF 28-105mm 3.5-4.5 zoom lens in a protective pouch with both lens caps. Shipping and insurance from Naples, FL at the buyers expense. With the advent of digital capture, creating blurred images has become a great and inexpensive way to go out with your camera and have fun. And while many folks think that making successful blurred images is the result of being a sloppy photographer nothing could be further from the truth. In “A Guide to Pleasing Blurs” Artie and Denise will help you to unleash your creative self. The book is laid out in landscape format to make for easy viewing and easy reading on any decent computer monitor. You can order your copy of “The Guide to Pleasing Blurs” PDF now for only $33 by PayPal to birdsasart@verizon.net, by phone: 863-692-0906, or by clicking here. A download link will be delivered to you via e-mail within 12 hours or less (except on weekends). Please note: this book is available only as a digital file in PDF form. You will need either Adobe Acrobat Reader or Fox-it to read the file. Both are free downloads. Canon 800mm f/5.6L IS lens with the EOS-1D MIV. With 3-stop drop-in ND filter in place. ISO 100: 1/125 sec. at f/5.6. 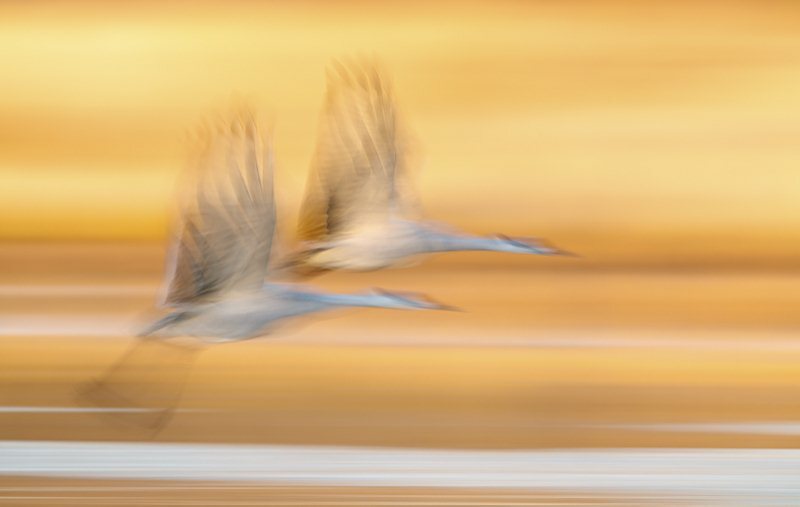 You will learn the range of shutter speeds that can produce sharp eyes and pleasingly blurred wingtips in both the Blur Guide and the Bosque Site Guide. Canon 800mm f/5.6L IS lens with the EOS-1D MIV. ISO 400. Evaluative metering +1 stops: 1/1000 sec. at f/7.1.